Seattle Preparatory School provides a technology-rich environment that supports collaborative partnerships, enriches teaching and learning, and encourages meaningful experiences for members of our community. Through the appropriate use of technology, students are engaged in their learning process, become independent problem solvers and participate ethically and safely as digital citizens of the world. Seattle Prep has established a one-to-one environment in which each student has his/her own device. Seattle Prep has been working diligently in preparation for the transition to the Microsoft Surface for the 2017-2018 school year. The school has selected the Microsoft Surface Pro 4 as its required 2-in-1 (laptop-tablet hybrid) device for members of the Class of 2019, Class of 2020, and Class of 2021. Members of the Class of 2018 will continue to utilize their iPads for their senior year at Seattle Prep. After conducting a great deal of research on the best purchase and distribution method of the Microsoft Surface Pro, we have determined that a bulk purchase by the school has many benefits, including significant savings for families. This also allows us to equip every machine with necessary applications and software for the upcoming year. The cost of the device will be $1,200, which is a significant savings from the retail cost of purchasing hardware, software, and warranty separately. This will include an integrated type cover keyboard, stylus, software, and accidental damage protection for 36 months. Student enrollment/re-enrollment contracts will provide an option for families to purchase the device in one payment or to divide the cost over ten payments using our FACTS tuition management system. Those with demonstrated financial need will receive assistance on this purchase. Student devices will be distributed in August 2017, prior to the start of school. Device distribution will include an initial orientation and training. Seattle Prep faculty and staff will continue to engage in professional development this year in preparation for the upcoming school year. When and how was this decision to move to the Microsoft Surface made by Seattle Prep? What version of the Microsoft Surface has Seattle Prep selected, and what are the specifications of the device? Why has Seattle Prep decided to continue requiring a standardized device? What is the requirement for the Class of 2018? What is the cost to families and how will we purchase the device? What will this mean for families receiving financial assistance? What if we already own a Microsoft Surface Pro? What happens if my device stops working or is damaged? How will the Surface Pro better enable teachers to manage classroom distractions? What software will be included in the Surface Pro 4? Are you offering Cloud storage to protect student data? 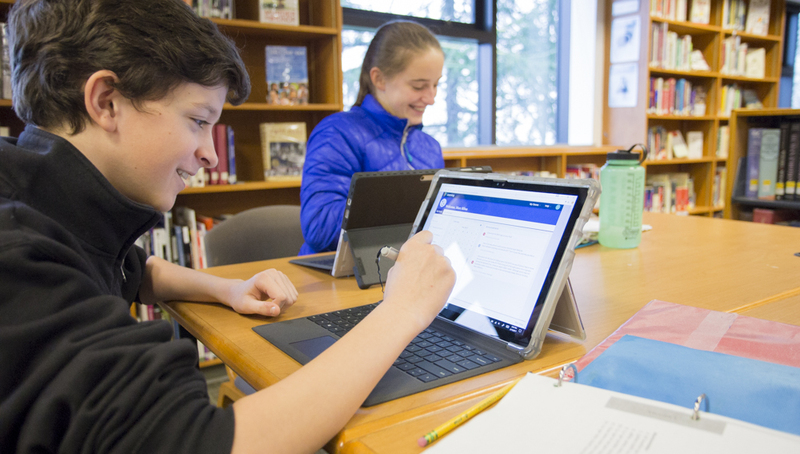 After a number of years where Seattle Prep utilized the iPad as its One-to-One Program device, the school decided to move to the Microsoft Surface Pro. Effective August 2017, students in the Class of 2019, Class of 2020, and Class of 2021 will utilize the Surface Pro 4 as a common device. Please click here to read the announcement communication for this transition sent in the spring of 2016. Brief Summary: The Microsoft Surface Pro 4 has a 12.3" screen and a standard, back-lit keyboard. The device converts into a tablet for ease of e-text reading and assignments requiring a stylus (pen). The device has both touch-screen (finger) and stylus (pen) capabilities. The device runs on a Windows 10 operating system and will have up to 10 hours of battery life. Detailed Specs: Intel Core i5 Processor 4GB RAM, 128GB hard drive, Wi-Fi (802.11a/b/g/n)Bluetooth®4.0 technology 10-hour battery life, 720p Camera, Backlit Keyboard, Windows 10 Pro Operating System, and Seattle Prep’s custom software image. There are many advantages to requiring a standardized device for all students. This allows students to seamlessly utilize all school-required software. Students will work with a standard device that effectively supports Seattle Prep’s curriculum and positively impacts student learning. Additionally, the school can more effectively support and maintain common devices, provide the devices at a lower cost to families (due to volume purchase discounts), and provide Accidental Damage Protection for 36 months to cover drops and breakage. Members of the Class of 2018 will continue using their iPads as the required device for our One-to-One Program. The school will continue to service and support seniors’ iPads for the 2017-2018 school year. The cost of the device will be $1,200. This includes a type cover keyboard, stylus, software, and accidental damage protection for 36 months. Student enrollment / re-enrollment contracts will provide an option to purchase the device in one payment or to divide the cost over ten payments using our FACTS tuition management system. Those families with demonstrated financial need will receive assistance for the purchase of the device. Financial aid for the devices will be reflected in the student enrollment / re-enrollment contracts that families will receive this spring. Assistance for the One-to-One Program will be proportionate to the assistance families receive for tuition. Questions about financial aid should be directed to Sue Dmitriev at 206-577-2138 or Matt Throckmorton at 206-577-2139. Families that already own a Surface Pro that meets the minimum specifications do not need to purchase an additional device. Devices will need to be approved by the Technology Department and families must coordinate a time to image the device with necessary student software. Approval should be requested before the enrollment / re-enrollment deadline. Questions, or requests for approval, should be sent to Phil Dietrich at helpdesk@seaprep.org. The Surface Pro 4, purchased through Seattle Prep, includes extended warranty coverage and extended accidental damage protection. Devices will be protected at no additional cost for most warranty and damage incidences for 36 months. All devices that are damaged or in need of repair should first be taken to the school’s Help Desk located in the McKay Library (helpdesk@seaprep.org). Depending on the situation, students may be directed to a local Microsoft Store. Repeated damage incidents may exceed the annual accidental damage coverage and result in some out-of-pocket expenses by the family. Lost or stolen devices are not covered under the Accidental Damage Protection provided with the devices. Lost or stolen devices may be covered by family homeowner’s or renter’s insurance policies. One of the many reasons Seattle Prep selected the Surface Pro 4 was because it gives teachers the ability to manage student use in the classroom. We believe that the classroom management software available on the Windows platform will help reduce classroom distractions. Microsoft Office 2016, Microsoft Office 365/OneDrive/Outlook e-mail, Windows 10, Sway, Skype, Office Lens, Microsoft Learning Tools for Office, and Windows Defender Anti-virus. It is critical that students assume responsibility for saving their work appropriately. Students at Seattle Prep will be trained to use cloud-based Microsoft Office 365 to ensure back-up of their files. They will be led through a process of configuring Microsoft Office 365 during a technology orientation. Devices will be distributed to students in August 2017, prior to the start of the 2017-2018 school year. Students will receive an orientation and training that will include operating the device as well as various functions such as the configuration of Office 365, the access and navigation of electronic textbooks, the use of school-installed software, and the importance of following school policies.